Michel A. Westenberg obtained his PhD degree on 14 September 2001. Over the last decades, exploration and visualization of large three-dimensional (3-D) data volumes has become important in many scientific areas. Such volumes are obtained by physical measurements (magnetic resonance imaging, computerized tomography), numerical simulations (computational fluid dynamics), or modelling (computer aided design). The process of generating two-dimensional (2-D) images from volume data is called volume rendering. Recently, researchers have developed an interest in exchanging volume data and performing collaborative visualization through the Internet. In the context of volume rendering, one may think of client/server systems in which volume data are stored on a central server and visualized on one or more remote clients. Bandwidth is a limiting factor, therefore, these systems require fast and efficient methods of transfer and display. This requires a mechanism to visualize data incrementally as they arrive through the network, a technique called progressive refinement. For this purpose, multiresolution models have been developed, allowing a systematic decomposition of the volume data into versions at different levels of resolution. Wavelets are a natural candidate for such a multiresolution approach. In this project a number of wavelet-based volume rendering methods were investigated which are extensions of standard X-ray rendering. This method integrates the data values along the line of sight, resulting in images that look like X-ray photographs. Extensions were developed to standard algorithms, viz., splatting and Fourier volume rendering. Splatting is a method that reconstructs the underlying continuous function from the discrete volume data by convolution with a reconstruction filter, followed by a mapping to the view plane by superposition of building blocks called footprints. These are the result of integrating the reconstruction kernel along the line of sight. Fourier volume rendering makes use of frequency domain techniques, and provides another efficient way to perform X-ray rendering. Fourier volume rendering starts by computing the 3-D Fourier transform of the volume data. For a given viewing direction, an image is made by computing the values of the Fourier transform in a slice plane parallel to the view plane and through the center of Fourier space, followed by an inverse 2-D Fourier transform of the slice plane. process in two phases: (i) coefficient accumulation and (ii) a final convolution with the footprint. Fourier volume rendering. The method combines integration along the line of sight with a simultaneous 2-D wavelet transform in the view plane perpendicular to this line, resulting in a decomposition of the input data into various levels of approximation and detail coefficients. This is called the wavelet X-ray transform, and an efficient algorithm to compute this transform was obtained by using a frequency domain implementation of the wavelet transform. uses a set of precomputed sequences of wavelet approximation coefficients in the Fourier domain for different viewing directions, and results in a more computationally efficient rendering for improved user interaction. 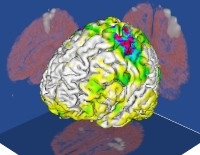 Wavelet-based rendering of CT data of a human head from a level-2 decomposition. Left: only level-2 approximation coefficients used. Middle: level-2 detail coefficients added. Right: level-1 detail coefficients added. Michel A. Westenberg and Jos B. T. M. Roerdink (2001) An extension of Fourier-wavelet volume rendering by view interpolation. Journal of Mathematical Imaging and Vision, 14(2):103�115, 2001. Michel A. Westenberg and Jos B. T. M. Roerdink (2000) Frequency Domain Volume Rendering by the Wavelet X-Ray Transform. IEEE Transactions on Image Processing, 9(7):1249�1261, 2000. Michel A. Westenberg and Jos B. T. M. Roerdink (2000) X-Ray Volume Rendering by Hierarchical Wavelet Splatting. In Proceedings of the 15th International Conference on Pattern Recognition. Barcelona, Spain, September, pages 163�166, September 2000. Michel A. Westenberg and Jos B. T. M. Roerdink (2000) X-Ray Volume Rendering Through Two-Stage Splatting. Machine Graphics & Vision, 9(1/2):307�314, 2000. Best Paper Award GKPO'2000, 6th International Conference on Computer Graphics and Image Processing, May 15-19, 2000, Podlesice, Poland.